Unless you are lucky enough to send your child to a school with organic lunches and a farm to school program, you probably pack your child’s lunch. We’ve reviewed numerous lunch boxes and lunch systems, but in the end, I usually just grab random items and throw then together in my hurried mornings. Despite my haphazard lunch packing routines, I am really excited about the Munchgear Soup to Nuts Kit (so are my kids who are fighting over who gets to use it tomorrow. 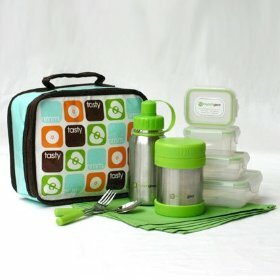 This reusable lunch system is “muck-free”: Lead-free, BPA-free, PVC-free and phthalate-free. One day, while noticing the gazillion plastic baggies I was using to pack lunches, I decided to make a small change and replace the bags with reusable containers instead. Eliminate three plastic bags a day, five days a week for a year. That’s 780 plastic bags I would be personally responsible for eliminating from landfill! Add to that the 260 juice pouches, 260 paper napkins, 260 plastic utensils. Now double that if you have two kids, triple that if you have three…you get the idea. With one small change to a daily habit, one family can make a significant difference in reducing waste. We love our Munchgear Soup to Nuts Kit for its convenience, worry-free materials, and chic design! Now we want one for everyone in our family, including the adults. Disclosure: I received a complimentary Soup to Nuts kit to test and review from Citizenpip. I was not paid by Citizenpip for writing this post. After reading the article about “Inflatable Jump Bounce House Contain 70 Times Safe Level of Lead” I was very concerned about my Intex PVC Self Rising Pool. This summer was so hot the pool water warmed up as if it was bath water and most of the summer days my children spend hours in the pool. If the jump house contains this amount of lead am I putting my children in a toxic pool? I don’t know, but I would suspect if it is made of PVC, it contains lead. You could try a home lead test kit, but I don’t know how accurate they are. Consumer Reports ranked them.